Time Magazine has called Gene Baur "the conscience of the food movement." 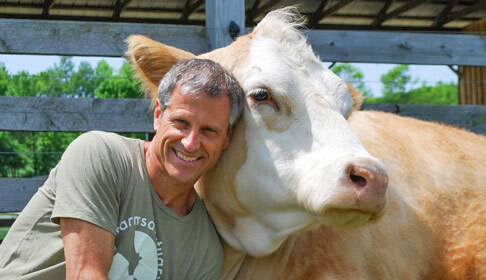 He is the Founder and President of Farm Sanctuary, the first farm animal rescue organization in the country, which opened barn doors in 1986. Gene is an activist and author who promotes a vegan lifestyle in his book, Living the Farm Sanctuary Life as he competes in marathons and iron man events around the country in part to demonstrate that vitality and good health is possible with a plant-based diet. When Gene visited the Bay Area for a radio appearance on KQED, we were able to meet in Golden Gate Park for a conversation about the impacts of factory farming on animals, workers, the environment and human health, and his path to advocacy and activism.